The core data access model for vector information in GeoTools is built around the DataStore class. DataAccess represents a storage location or service for spatial data. T: FeatureType - class used to describe content. F: Feature - class used to represent content. Currently Feature and SimpleFeature are available. You can use the DataAccess interface to get a list of the contents, retrieve a little bit of information about the contents (such as their name, bounds and description). To actually retrieve the data contents you will ask the DataAccess interface for a FeatureSource based on the content Name (using the Name) of the features that you want. We will discuss FeatureSource in the next section. Some DataStores, like Web Feature Server, may provide additional information in the object they return from getInfo(). Used to define the contents of a shapefile, or add a new table to database. Not supported by all DataStores. Used to modify the contents of a shapefile, or alter an existing table. Not supported by all dataStores. Used to remove an existing table. Not supported by all dataStores. The DataStore interface is a DataAccess subclass that provides to explicitly work with content providers that only know how to deal with SimpleFeature and SimpleFeatureType. Access to SimpleFeatureType based on name. You can access SimpleFeatureSource based on a type name supplied as a Name or a String. Access to a low-level FeatureReader and FeatureWriter class allowing direct access to DataStore contents (complete with IO Exceptions). The various FeatureWriter methods require a Transaction (i.e. session) to perform their work on, and allow existing content to be updated or new content to be appended. Access to the LockingManager used to sort out any time based locks acquired on to restrict access when multiple threads are working on the same information. A FeatureSource is used to provide access to the contents of a DataStore. As you can see FeatureSource provides different subclasses depending on the level of access available. So a read-only file will be an instanceof FeatureSource while a writable file will be able to return a FeatureStore. // ClassCastException if "roads" is not writable! SimpleFeatueSource is the extension of FeatureSource returned by DataStore to explicitly work with SimpleFeature and SimpleFeatureCollection. In the case of SimpleFeatureSource these methods will return a SimpleFeatureCollection. Access to metadata describing the contents and capabilities available. May return null if the bounds are unknown or too costly to calculate. May return -1 if the information is not readily available. Formats such as shapefile keep this information available in the header for handy reference. WFS does not provide any way to ask for this information and thus always returns -1. Used to stage a request for information, identifying a set of features using a filter, the attributes requested along with any additional hints for processing. The typeName information must match your featureSource (and explicitly required when sending a Query directly to a DataStore). Override to request a specific namespace, or use Query.NON_NAMESPACE. Simple string “handle” to identify this query in any logs or error messages. Paging support is available using a start and max features as part of your Query. The same options are available using PropertyName in order to support XPath expressions with namespace information. When working with versioned data you ask for a specific version. Override this value in the event the datasource is incorrect and your user knows the correct CoordinateReferenceSystem. Used to transform the information to requested CoordinateReferenceSystem. How to count the number of features. Because the getCount method just checks the file or database header information it is designed to be very fast. Not all implementations have access to this information making it a bit tricky to count the number of available features. SimpleFeatureStore is an extension to FeatureStore returning SimpleFeatureCollection as expected and allowing the contents to be modified using a simple String to indicate attribute. SimpleFeatureStore allows attribute information to be represented as a simple String. Used to control the current editing process and close the transaction when it is completed. 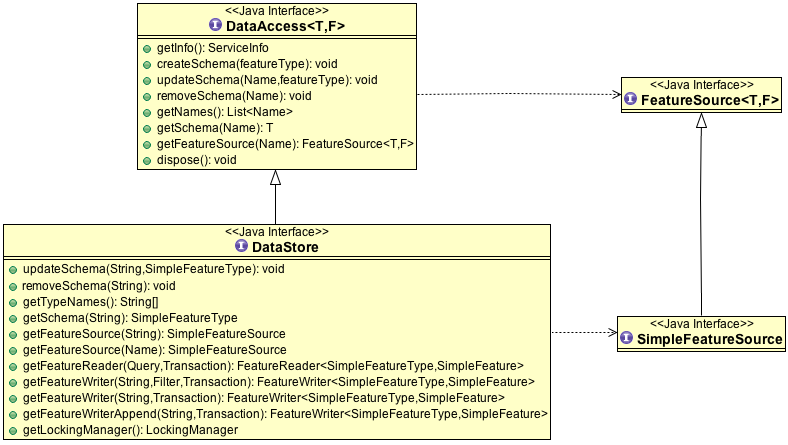 Transaction properties used to hold values for the duration of a transaction. There is also a placeholder Transaction.AUTO_COMMIT available to configure a FeatureStore to write out each change as it occurs. For internal use Transaction also holds session information for commit and rollback. FeatureLocking adds a couple of methods to support the idea of time based locking. Each lock request is made for a specific duration, if attempt to modify the locked features requires an authorisation code. Any modifications made without the authorisation code will result in an error. Authorisation codes can be configured per transaction (and may in fact apply to more than one DataStore). Set the FeatureLock being requested. Lock all features, or limit the features being locked with a filter or query. Session information for FeatureLocking is captured with a FeatureLock. This represents the request being made with each call to lockFeatures. Used to configure a FeatureLocking to request that features be locked for a set duration of time. Resulting in a set of authorisation Strings. These strings can be used to configure a Transaction allowing locked features to be operated on. To create a DataStore GeoTools uses a plugin system based around the DataStoreFactorySpi class. Used to create a DataStore using the provided map of connection parameters. Please note this is used to connect to an existing source of information such as an existing shapefile or an existing web feature server. Used to create a new storage location (example a new shapefile). Human readable name and description. Used to check the required connection parameters and confirm they can be processed into a DataStore. Note the DataStore may still not work (if for example the username and password were incorrect). This method confirms the required information is available. Some formats require additional jars to be available on the CLASSPATH. As an example database formats often require a JDBC driver to be present. This method will perform a check and confirm that the needed dependencies are available providing a smooth way for the DataAccessFactory to report if it is unable to connect.